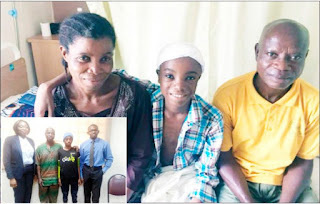 For God Is Great, a 16-year-old boy, the success of his surgery from subdural empyema is a clear manifestation of the divine fulfilment of his name. Subdural empyema is an intracranial focal collection of purulent material located between the dura mater and the arachnoid mater. God Is Great was diagnosed with subdural empyema early this year. The CT scan showed a hypodense collection in the frontal region of the subdural space – space between the skull bone and brain – with a collection of gas above it. Based on clinical features and radiological findings, the diagnosis was a bi-frontal (involvement of both side of the anterior aspect of the subdural space) subdural empyema. It all began with a simple complaint of a headache and fever but was treated for typhoid. After being placed on admission and discharged from a hospital in Badagry, he still complained of the headaches and fever. He went back to the hospital and was asked to do an x-ray. God Is Great was then referred to Badagry General Hospital, where he was sent for a CT scan. He was again referred to a Navy hospital, but there was no equipment to handle the medical situation. He was eventually taken to Lagoon Hospitals by his family. God Is Great’s condition had got worse after his parents spent all of their money in various hospitals. For the family, Lagoon Hospitals was the last hope. Dr Mowa Falase, a Paediatrician and Medical Director at Lagoon Hospitals, Lagos, while confirming this told DAILY INDEPENDENT, “Circumstances under which he came to us will make anybody say God Is Great; he is certainly living up to his name. “He came in that evening to us and this time I am referring to is when every government hospital decided to go on strike. Usually, the two teaching hospitals in Lagos are not usually on strike at the same time, but this time both of them decided to go on strike. “Both the Lagos University Teaching Hospital (LUTH), Lagos State University Teaching Hospital (LASUTH), even all General Hospitals, decided to go on strike and then God Is Great came here. It is common thinking that once teaching hospitals are on strike there are not many other places that can handle his sort of case. “But, he came in, and we saw him and he had a CT scan that determined the problem that he had which involved his brain and the treatment required. Dr Falase also disclosed that the entire staff put together their support and saved God Is Great’s life. According to her, the surgery took place on May 22, this year, with the assistance of a senior member of the facility who saw that he would not survive much longer with an operation and recommended that the surgery is done pro-bono (free of charge). “The family was supposed to deposit at least N3.5 million for the operation to take place, but they didn’t even have enough money to register him as a new patient. She revealed that Nigeria only has 81 neurosurgeons in the country, noting that these specialists are rare and should well be remunerated and cared for in Nigeria. “God Is Great’s case is just one in a million. My advice to all Nigerian parents is to help protect their children’s health and listen to their complaints because not all signs are a fever. “If you have a cold beyond two weeks, there is a need for you to see your family physician, paediatrician, an ear, nose and throat specialist that can pick those symptoms, so they can be treated on time,” she counselled. In appreciation of the organisation, Godwin and Veronica Ebhodaghe, parents of the patient, thanked the hospitals for saving their son’s life and commended the professionalism and warmth of the staff. “The care I received has inspired me. I thank everyone for working here,” God Is Great told DAILY INDEPENDENT. “I would like to be a military medical doctor when I grow up,” he added. On his part, Dr Chinazor Onyia, the neurosurgeon at Lagoon Hospitals who performed the surgery explained, “The decision was that God Is Great needed an operation immediately. It was an emergency as the situation was critical. “So we drilled a hole in the skull or a smaller opening because the pus had gone beyond the features. I had to open more because of his age so that I would be able to drain it properly and that was what I did,” the doctor clarified. During the surgery, findings were that a collection of foul-smelling pus on both sides of the anterior of the subdural space, extending into the frontal sinus, he added. The pus was evacuated; he was subsequently placed on antibiotics and he is currently doing well after he has been discharged, the neurosurgeon added. The prevalence of subdural empyema worldwide is approximately five to ten per cent. The prevalence of subdural empyema is high in developing countries generally than in developed ones. However, parents need to be enlightened about this here in Nigeria, Dr Onyia advised and added, “On God Is Great’s case, history helps us to diagnose, investigate and find the likely reason this happened. So, it is applicable to other clinical matters. “We suspected that he had recurrent catarrh after the fall, which became unusual with yellow mucus, which was a sign of infection. Sometimes, patients’ immunity and capacity to fight infections could be from not having good diets, and some common factors can expose the patient to viral infections and when that is done, the risk of having bacteria occurs, the neurosurgeon also explained. On complications, he said, sometimes someone will have a clinical problem, he might offer information that they feel could help in diagnosis, but knowing the clinical problem is very necessary because problems might have been there. Giving further details, Dr Onyia said, “Subdural empyema complication can rapidly spread to involve an entire cerebral hemisphere. “Patients with subdural empyema develop meningeal signs. Most of the times, subdural empyema tends to occur in teenagers/ adolescents. It often causes recurrent sinusitis or sinus infection, which is inflammation of the air cavities within the passages of the nose. He also explained, “Another sign is if all symptoms are ignored, the patient might develop seizures that usually progress over several days or even recurrent convulsion. And if nothing is done at this stage, the patient would begin to have impaired abnormalities like speech loss or might even be in a coma. “Most of the time, subdural empyema can lead to death but not sudden death. However, problems with the brain follow a cause because they progress with symptoms. The collections of the problem with the brain tell us what the issue is and the thing to do to carry out the necessary surgery with the brain,” he said.